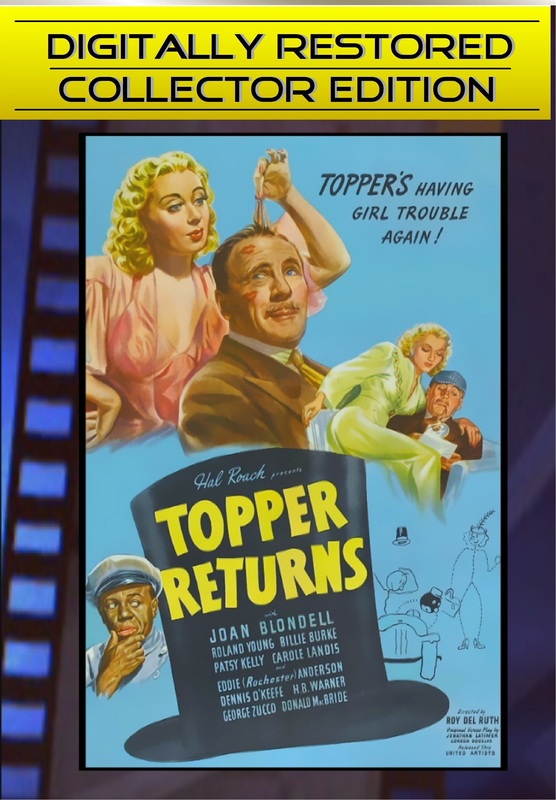 Topper Returns ~ Digitally Restored ~ Starring Joan Blondell, Roland Young, Carole Landis, Billie Burke, and Eddie “Rochester” Anderson. Once again banker, Cosmo Topper (Roland Young), is visited by a spirit, Gail Richards (Joan Blondell). This time the spirit needs Topper to find her killer. Gail is mistakenly murdered after trading bedrooms with her wealthy heiress friend. Chauffeur, Eddie “Rochester” Anderson’s performance is truly priceless, proving he is one of the funniest actors of his time. Be sure to pay close attention when the lights go out and the room becomes pitch black. Only problem, there is a raging fire in the fireplace. Considered to be the best of the Topper movies, this brilliantly written comedy-mystery is guaranteed not to let you down.